By William A. Jurgens. An indispensable collection of passages from the early Church Fathers. Its superb doctrinal index allows immediate reference to the beliefs of the early Church on almost any topic, such as the Eucharist, primacy of Peter, infant baptism, and intercessory prayer to saints, Mary, and purgatory. 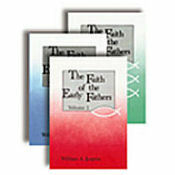 Taken together, these three volumes represent a basic English-language reference book of patristic works. Volume 1 ends circa 382; Volume 2 concludes with Julian of Eclanum (d. 454); Volume 3 ends with St. John of Damascene (d. 749).